One of the greatest dividing aspects of the success of a film score is the in-film experience and the out-of-film listening experience. Your regular run-of-the-mill underscore might be employed expertly in creating suspense and atmosphere as the film motors onwards, yet as a pure listening experience it may categorically fail. 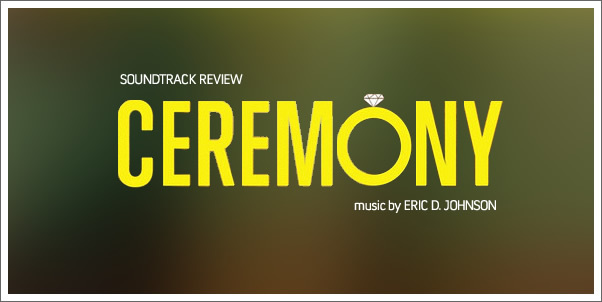 Depending on your musical tastes, ERIC D. JOHNSON’S score for CEREMONY epitomizes this conflict between listening states. CEREMONY, written and directed by MAX WINKLER, tells of young writer Sam Davis (Michael Angarano) and his attempt to halt the wedding and win the heart of Zoe (Uma Thurman). What unravels is somewhat of a love it or hate it film and the same can almost be said of the score.